Today is your last chance to save $5 off the regular price and order “Life in Christ” catechism materials at the pre-publication price of only $10 per book! Perhaps you, like many Christians, are concerned about recent studies that indicate an alarming number of young adults have left the Christian faith in which they were raised. Various estimates range from 60% (George Barna, barna.org) to 70% (USA Today, August 7, 2007) to even 75% (Frank Turek, crossexamined.org)! You may think those sobering statistics reflect trends of liberal churches in mainline denominations, but according to Ken Ham and Britt Beemer, two-thirds of the youth in conservative, Bible-believing churches are already gone in terms of their faith commitment. Their research shows that of those young adults who no longer believe all biblical accounts are true, 39.8% first had doubts in middle school, 43.7% first doubted in high school, and only 10.6% first experienced doubts during college (p. 32, Already Gone, Master Books, 2009). Even young people growing up in Bible-believing churches are failing to accept the entirety of the Bible (especially the foundational chapters of Genesis) as true, failing to develop a biblical worldview that applies God’s Word to their lives, and failing to learn how to defend their faith in the face of modern challenges. Reformed and Presbyterian churches with solid catechism programs may have a lower incidence of young people leaving the faith, but even these churches must do all they can to instill truth and strengthen faith in covenantal youth. Catechism instruction ought to enable students to know God’s Word as truth and to apply it to their lives. A distinctively Reformed perspective and unified program characterize the “Life in Christ” catechism curriculum. The curriculum presents a full-orbed perspective not only in its material, but also in its method. The “Life in Christ” catechism curriculum include memorization of crucial biblical and confessional material, but it goes beyond mere rote memorization by incorporating application and apologetics. While students learn God’s Word, they also learn how to apply it to their lives and defend their faith in the world. 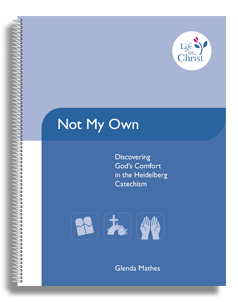 I learned yesterday that a small church has ordered copies of my Not My Own: Discovering God’s Comfort in the Heidelberg Catechism for its combined class of grade 5-8 catechism students. It’s my prayer that every instructor and student who uses the material will grow in grace and truth as they explore the biblical basis for the Heidelberg Catechism and discover the comfort of belonging to Christ.